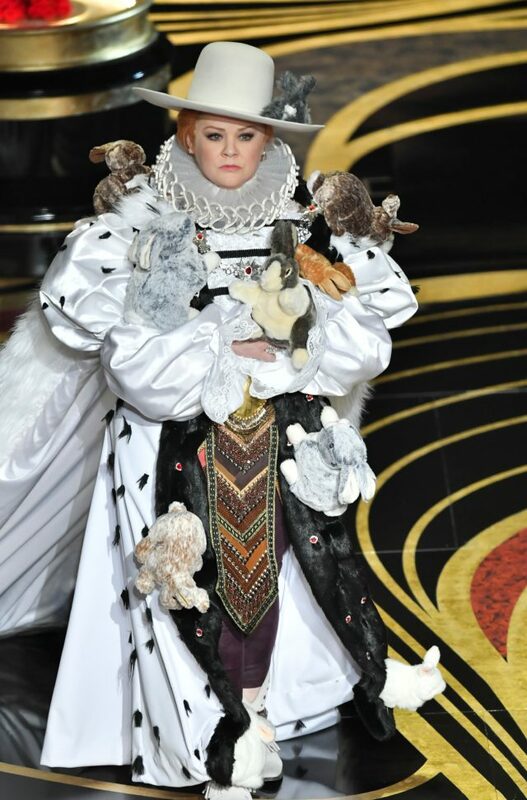 McCarthy and co-presenter Brian Tyree Henry were in period dress, with McCarthy dragging a long ermine-trimmed cape decorated with the stuffed bunnies in reference to Olivia Colman’s character Queen Anne in the film, who owned 17 rabbits. McCarthy’s outfit, which was coupled with Henry’s similarly regal attire, was warmly appreciated by fans. The 48-year-old, who is nominated for best actress for her performance in Can You Ever Forgive Me?, went on to use a rabbit hand puppet to open her envelope and present the award. The category was won by Ruth Carter, who become the first black winner of best costume design for her work on Black Panther.